Cueva fungicide concentrate is a patented, fixed copper fungicide made by combining a soluble copper fertilizer with a fatty acid to form a true soap. This copper soap fungicide protects plants from infection from a wide range of diseases, including downy and powdery mildews. 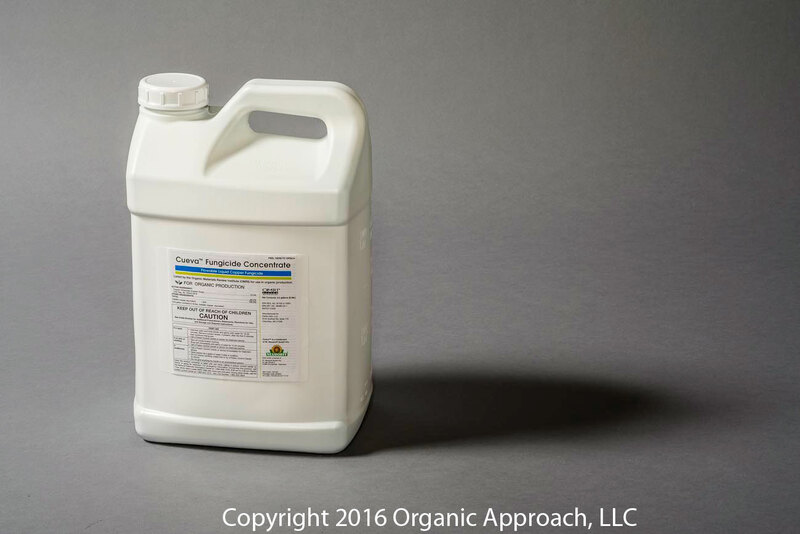 As with most fungicides, Cueva fungicide concentrate acts to protect plants from infection. Therefore, it is important to have Cueva on the leaf, flower or fruit before the pathogen is able to cause an infection. A wide range of bacteria and fungi attack plants, however, they generally only cause a few types of diseases. When using Cueva, it is important to identify the type of disease in order to use the best method of disease control. For best control, begin treatment 2 weeks before disease normally appears or when weather forecasts predict a long period of wet weather. Alternatively, begin treatment when disease first appears, and repeat at 7- to 10-day intervals for as long as needed. Mix 0.5 to 2.0 gallons of Cueva with 100 gallons of water. Apply 50 to 100 gallons of diluted spray per acre. Following heavy rain or when the amount of disease is increasing rapidly, use the 2.0 gallon rate. If possible, time applications so that 12 hours of dry weather follow application.